After years of casual courting, IT and business are finally forging effective ways of working together to pursue shared objectives for digital transformation. For years, CIOs have been chasing the Holy Grail of IT-business alignment with limited success and plenty of indigestion. Digital transformation has elevated the CIO role, yet IT leaders still struggle to foster effective collaboration between their organizations and business units at a holistic level. Long-standing perceptions of IT as mired in the technical weeds, disconnected from core business objectives and a bottleneck for speedy deployments, cast a shadow on the relationship, with lines of business (LOB) often taking a view of IT as an obstacle, not an enabler, for strategic innovation. While some disconnect remains, IT and LOB have turned the corner and are working far more collaboratively than in the past. The 2018 State of the CIO survey found stronger cooperation and better alignment between IT and its LOB partners, especially as digital transformation initiatives heat up. During the past year, almost three-quarters of respondents (71%) said IT and LOB engage more frequently in collaborative projects where there is shared oversight. On the digital transformation front, in particular, CIOs are playing a significant role assisting the business in driving innovation. Eighty-eight percent of IT leaders and 64 percent of LOB see the CIO role becoming more digital- and innovation-focused, the survey found. 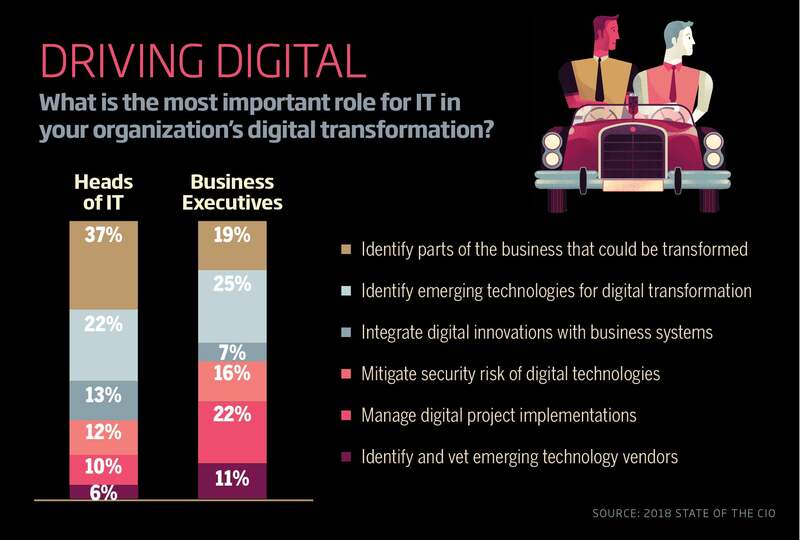 To that end, 37 percent of IT leaders said they actively engage with LOB to identify possibilities where technology can alter the business, while 22 percent are a guiding force in selecting the right emerging technologies to accelerate that transformation. The CIOs more likely to be active participants in digital innovation describe their role as transformational (36%) or strategic (45%), versus those that operate in a purely functional (32%) capacity. Business users are also starting to recognize the potential of IT’s contribution. Almost half (49%) of LOB respondents to the 2018 State of the CIO survey now consider IT a strategic advisor for proactively identifying new opportunities and for making technology and provider recommendations — a role cited by 52 percent of IT respondents. A third of LOB (31%) and IT (32%) respondents view IT as a consultant that provides advice on business needs and technology choices upon request. Twelve percent of LOB and 8 percent of IT respondents believe IT can be counted on to be a risk assessor, guiding an organization’s technology choices through the lens of risk management and governance.